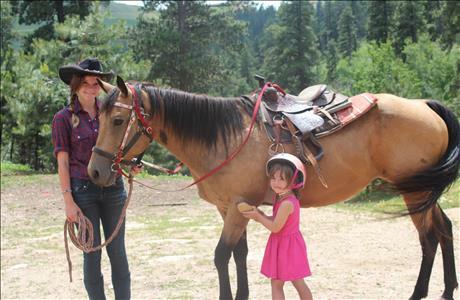 ​Blacktail Horseback Tours near Historic Deadwood. Blacktail Horseback Tours, centrally located between Deadwood and Lead, South Dakota in the Black Hills. You start your ride at the top of Bessie Gulch in the Black Hills of South Dakota. Your horse is assigned and you get riding instruction to help you enjoy your tour. You ride uphill, through switchbacks to a scenic overlook. You learn about the history of the Homestake Goldmine. The ride continues into the forest, you learn about forestry management practices. The next scenic overlook gives you a view of the area, learn about original mining stories and the people that lived in the area from 1876 until 1900 and a surprise. You return downhill to the ranch. Ask about our program for younger kids and timid riders.